French Emblems: Emblem: Boni adulterium. The adulteration of what is good. Scriptura pravis sica, fit scutum bonis. The same flower fills the Spider with her poisonous juice, As provides liquid honey for the Bee. The same phrase gives rise to unity and discord: Scripture that is a dagger in the hands of the wicked becomes a shield to defend the good. Iam iam efficaci do manus scientiae. Link to an image of this page [H5v p122]nam acciperent, quam ipse dextra porrigeret. An Archilochian iambic trimeter monocolon, like that line of Horace’s: “Now, now do I turn my hand to the powerful skill [of magic]”. 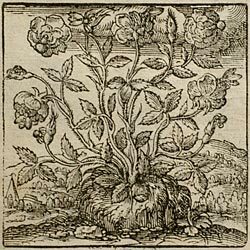 It is most true, what the poet Ovid said: “Each man follows the seeds of his own nature.” Certainly we see that the natural order of things is pretty much that there is nothing that can be, or be said, that is so good that some slander cannot twist, degrade, and perversely misrepresent it. So it was shrewd and witty of Theodorus the Athenian, to say, when the complaint was made that he made many men worse by his teaching, that this was a result of other peoples’ wickedness, since they accepted his teaching with their left hand, [p.122] when he offered it with his right. Nor does the common proverb sound a wrong note, that says ‘Each bird sings according to the melody that its beak makes’, since its meaning is that the wicked can only speak wickedly, and the good truly speak good. The rose assuredly provides a useful substance for the honey-bee, but poison for the spider. How often does it happen that a harmless statement, and one expressed ingenuously, should be a seed-bed of laughter and humour for the honey-bees of the world: but to the spider it is a tinderbox and enticement to Vatinian enmity. Holy Scripture, says St. Gregory of Nazianzus, in the first Steliteutice, is an armour of virtue for the righteous, but a spur to wickedness for the impious. 1. Jan van Zuren, printer in Haarlem, in Holland (d. 1591). 2. On this topic, cf. emblem XXXI ([FJUb031]). 4. P. Vatinius, a tribune in the last days of the Republic, was a man whom Cicero vehemently denounced (Oratio in Vatinium); his name became a byword for disrepute. Cf. Catullus 14.3 ‘Vatinianum odium’. Strictly speaking, the opposition of ‘huis’ and ‘illi’ would normally suggest the opposite, i.e. that in the bees it inspires enmity and in the spiders, merriment, but this is surely contrary to the meaning of the passage.